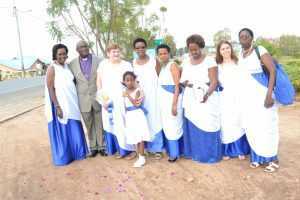 The Province of the Anglican Church of Rwanda is celebrating the fifty years Jubilee of Mothers Union in Rwanda. The ceremonies will take place on Sunday July 31st 2016, starting with Sunday service at Kibagabaga, EAR Gasabo Diocese in Kigali. Before this great event, the Mothers Union Worldwide President who already arrived in Rwanda will visit different Anglican Church Dioceses. It is in this order; today she started her journey by visiting Shyogwe Diocese. She has been welcomed by the Bishop Jered KALIMBA, the Mayor of Muhanga and many Mothers Union members from the different corners of the Diocese. 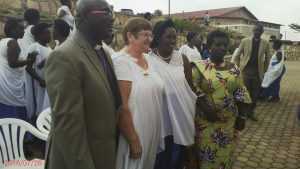 In Shyogwe Diocese, the Mothers Union Worldwide President visited the different projects leaded by Mothers Union: Youth at Risk Project, Single Mums Project, etc. She appreciated the role that the church is praying in helping people and welcoming the kingdom of God in the local communities. The Bishop of Shyogwe Diocese appreciated the visit of the Mothers Union Worldwide President in Rwanda in general and in Shyogwe Diocese in particular way. The Mayor of Muhanga appreciated the way in which the Anglican Church works together with the local government instances to help the neediest people and in different development activities.